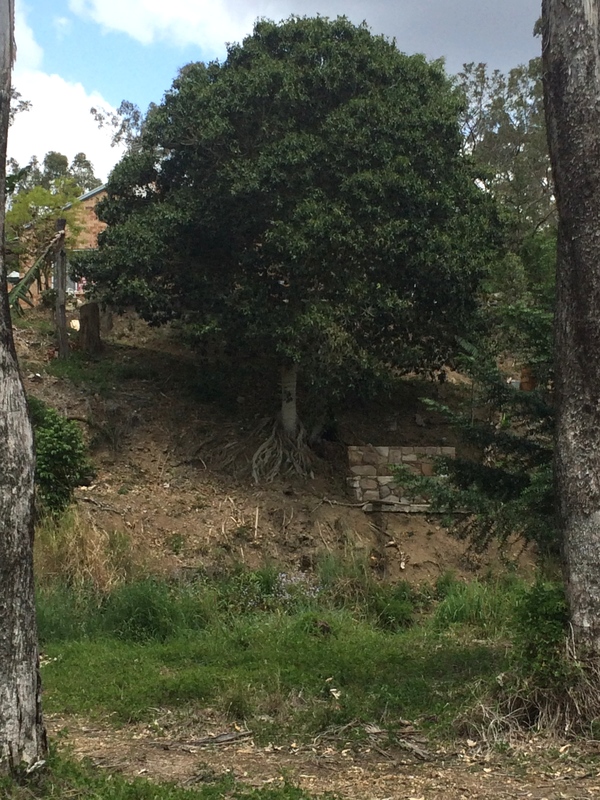 The gully is used as a tip for dumping machinery and large items of rubbish (septic tank, engine motors). John Collins (Jacaranda Press) buys the 10 acre property. 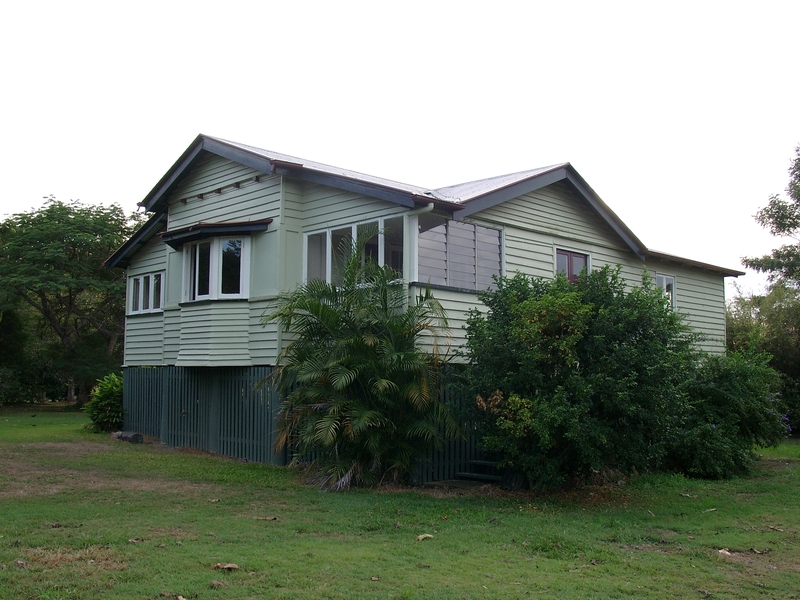 Collins family move into cottage which had been a manager’s house for the old dairy. 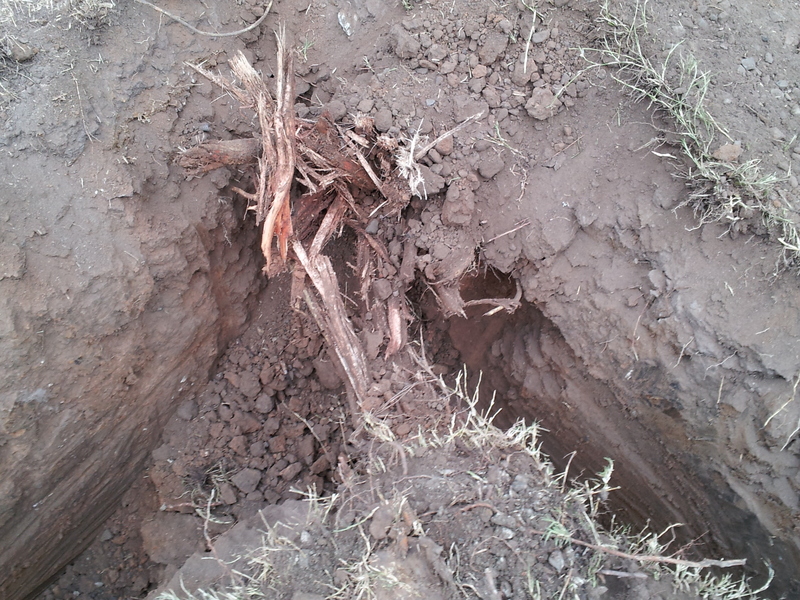 Plant 4 trees (gums in line in front paddock) for each of their daughters. 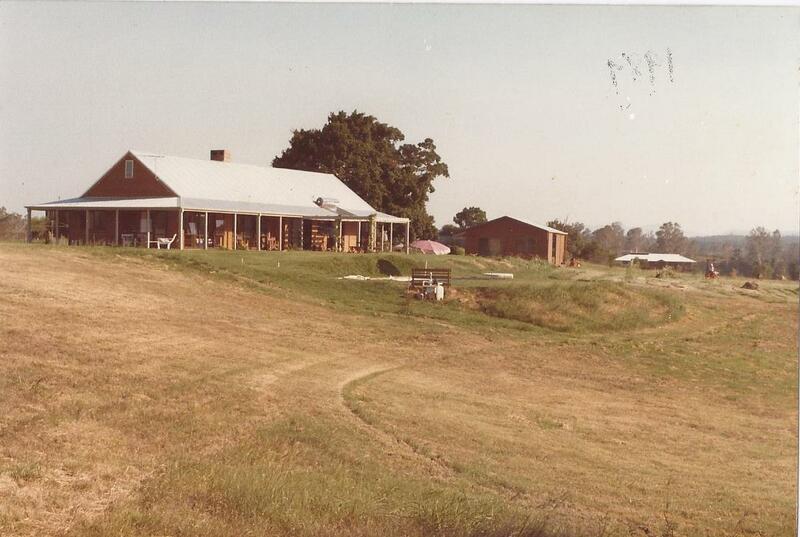 The whole front paddock flooded regularly during their residence of 10 years. The tallest Eucalyptus tereticornis is only half the size of its 2007 size. 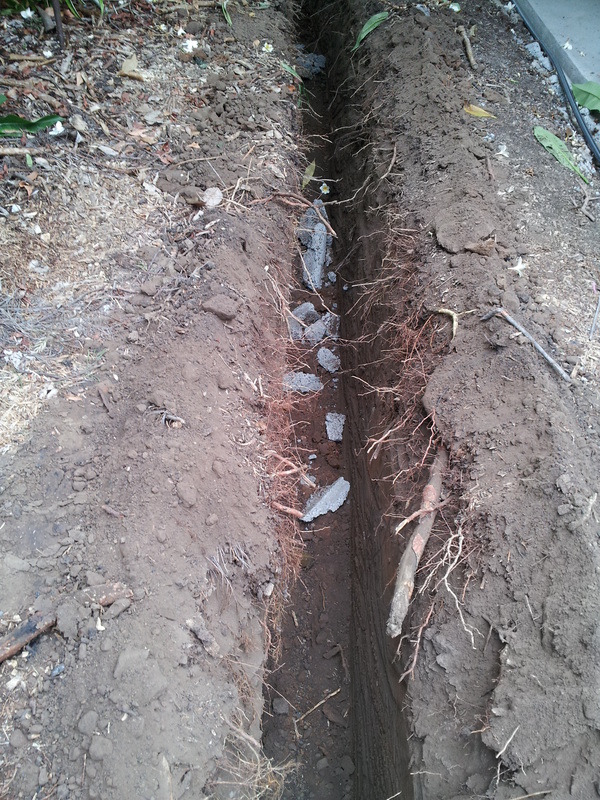 Plant figs and other trees – the Ficus virens is already there and is the reason they like the property so much. 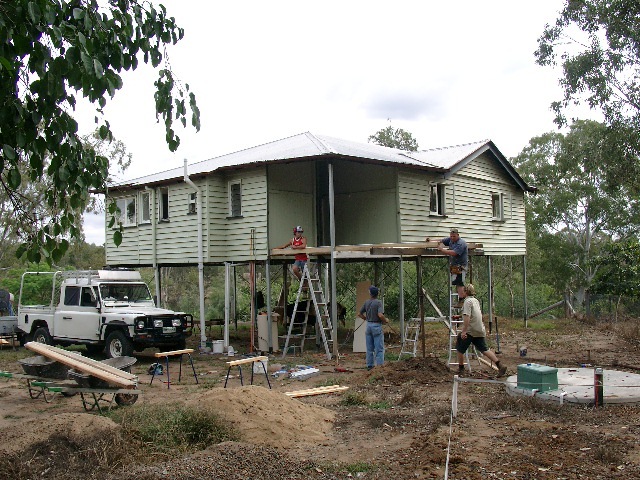 Build New Zealand Lockwood timber house. This receives a mention about its assembly in the local newspaper. Build pool (the pool pump is visible in foreground of above photo). 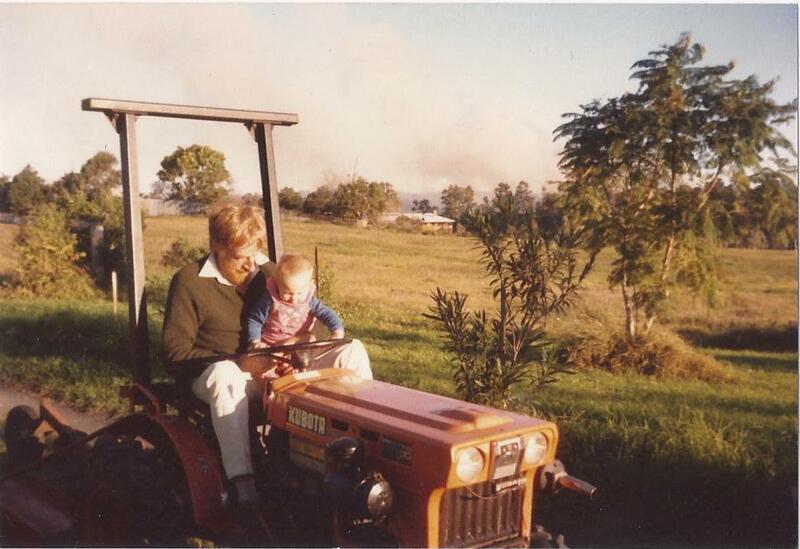 Buy Kobota tractor and slasher and manage land as a large mown lawn and leave the river frontage (with weeds which gradually encroach on the property). 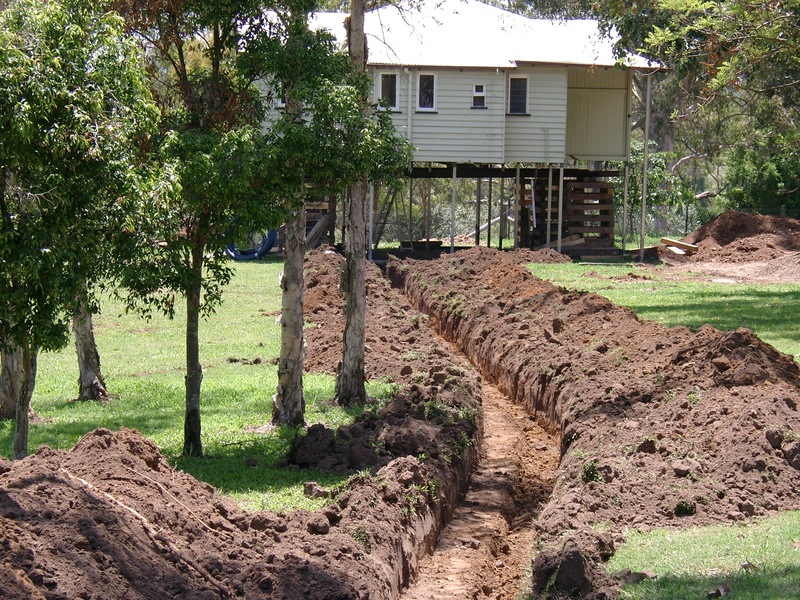 Plant trees on the southern boundary to provide privacy from the neighbours’ home. The Collins leave after living here from 1983 til 1993. The Matthews put in solar hot water service. 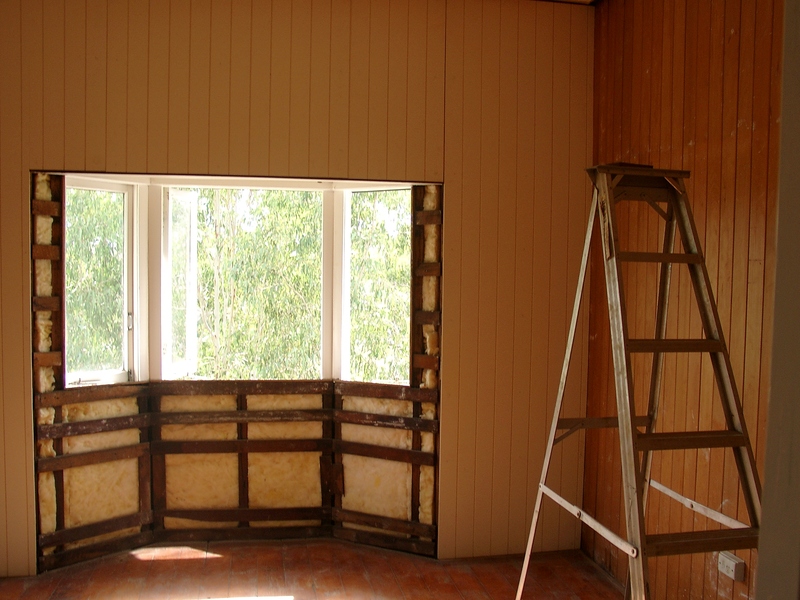 Mrs Wiseman puts screens on the house. Another fence built by Matthews. Sam and Gerry Doumaney own house. They have 3 big dogs. 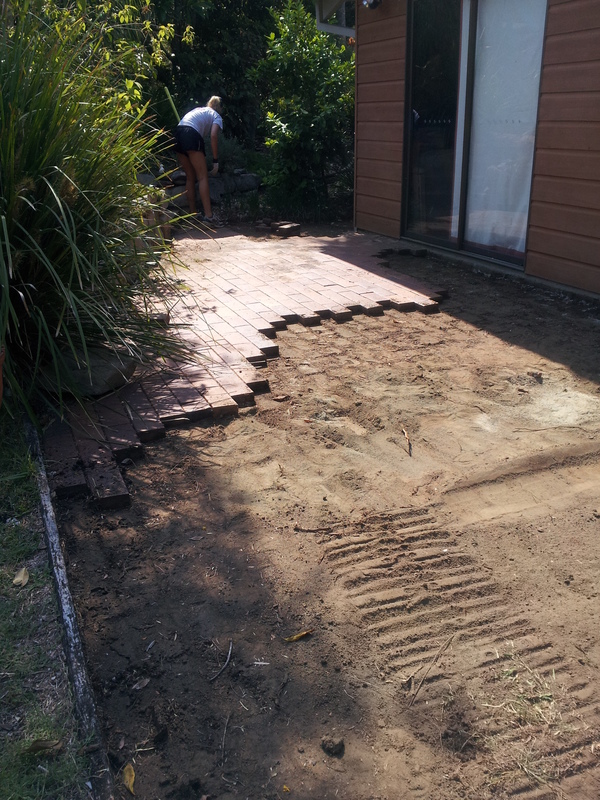 Replace back porch and extend from kitchen to make large covered and paved area. Sam shows us how high the flood came in 1974 and 1893. Sam shows us the orchard which originated with an earlier owner. 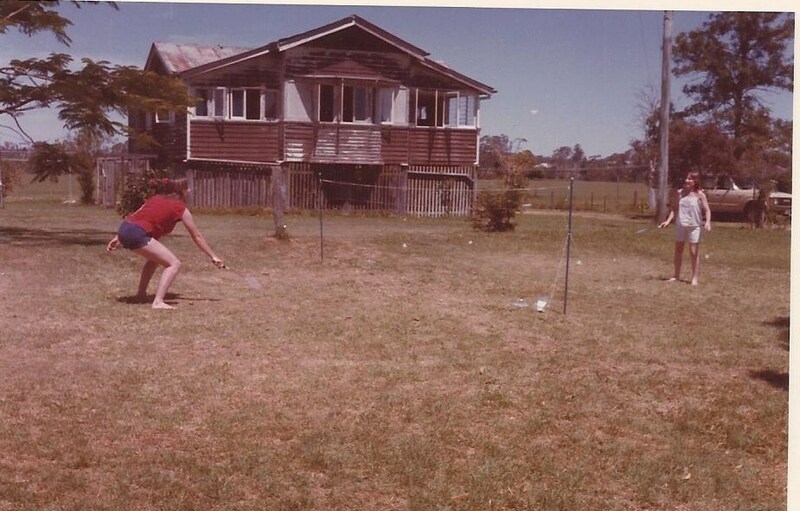 Sam passes on the idea that the property had been named ‘Yungaburra’ by a previous owner because the name meant ‘place of many figs’. 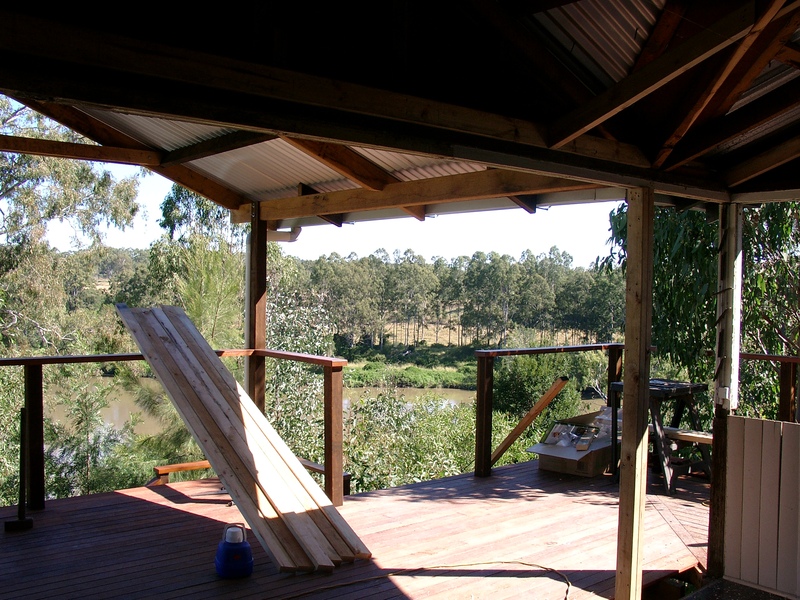 Yungaburra is the name of an Atherton Tablelands town in Queensland. 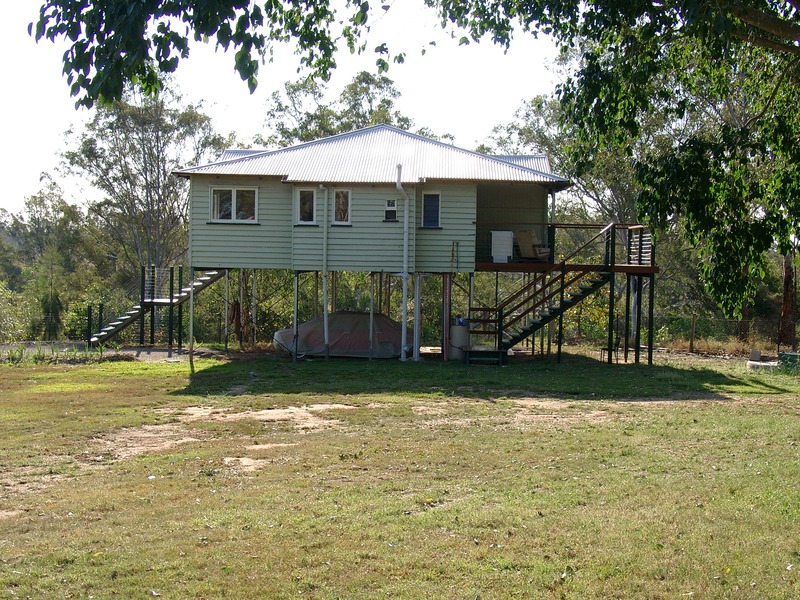 We have since found from http://yungaburra.com that the word is from the Yidinyji language (now extinct) and that it means ‘enquiring’/’questioning’. The cottage seems passable from outside but its interior has deteriorated badly. The Sampsons buy the property midway through the year. 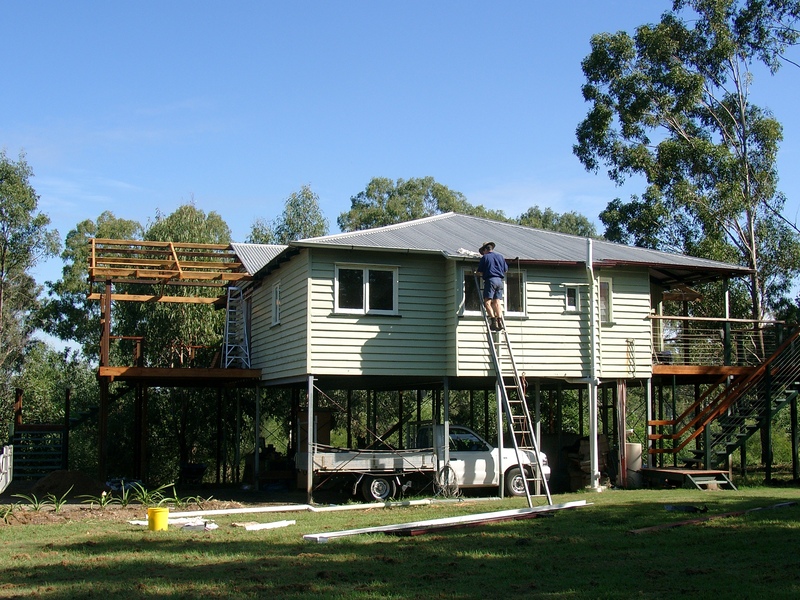 Ian meets with Bryan Hacker (Moggill Creek Catchment Group) and Margaret de Wit (Brisbane City Council representative) to discuss ideas for improving the property. 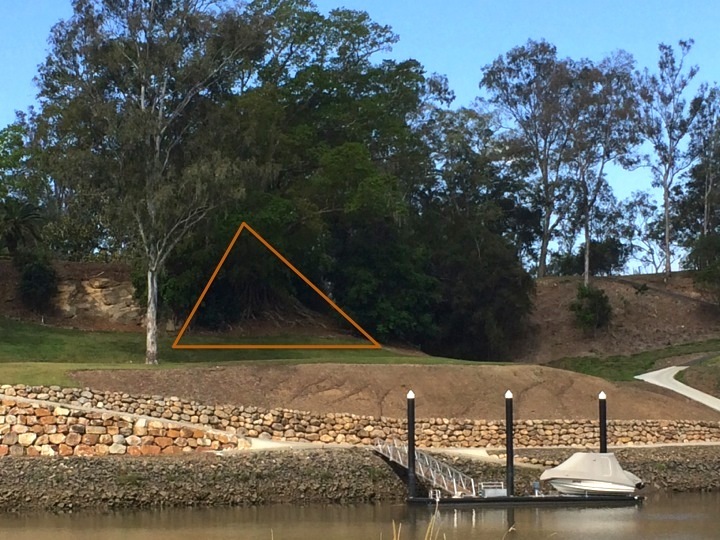 Suitable corner found for cottage to be placed and permission granted for cottage to be relocated so that it nestles into newly-created bush and it overlooks the Brisbane River. 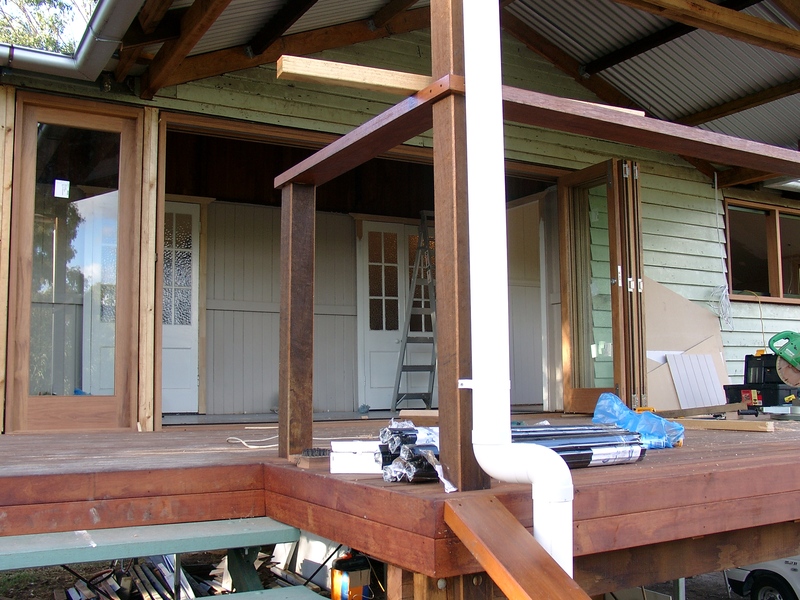 By September 2005 the cottage is habitable. Gerry moves her horses away. Ian plants garden under 2 figs on western side of house. There is good rain fall in second half of year. 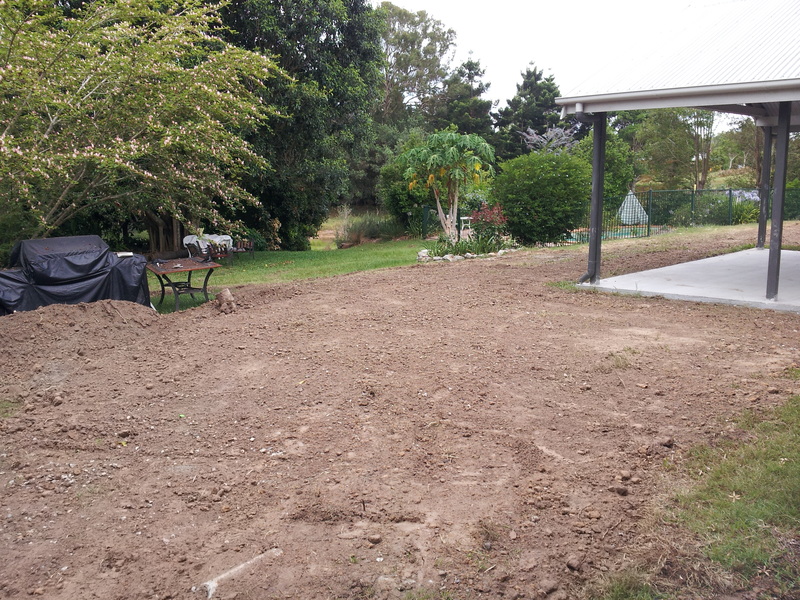 Janet begins to give substantial help with gardens and side paddock. 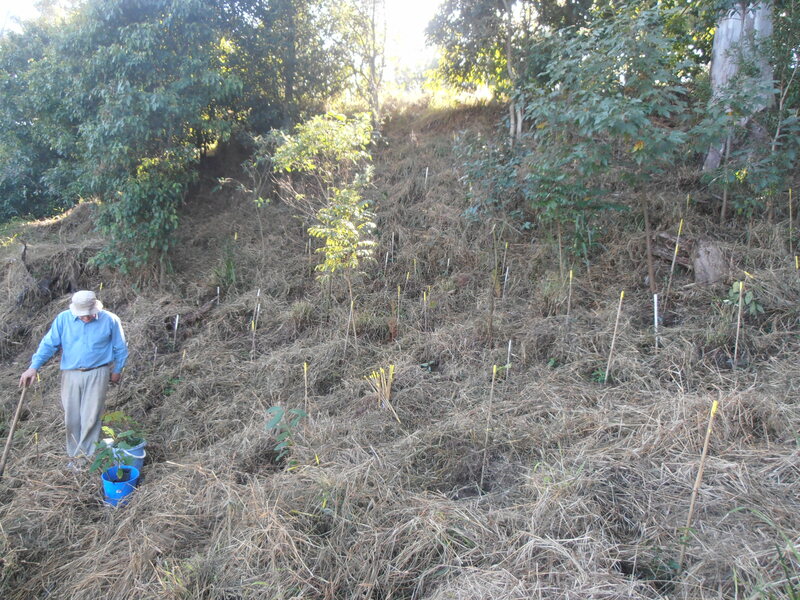 We both begin clearing and planting up the goat gully. Benson dies from paralysis tick. 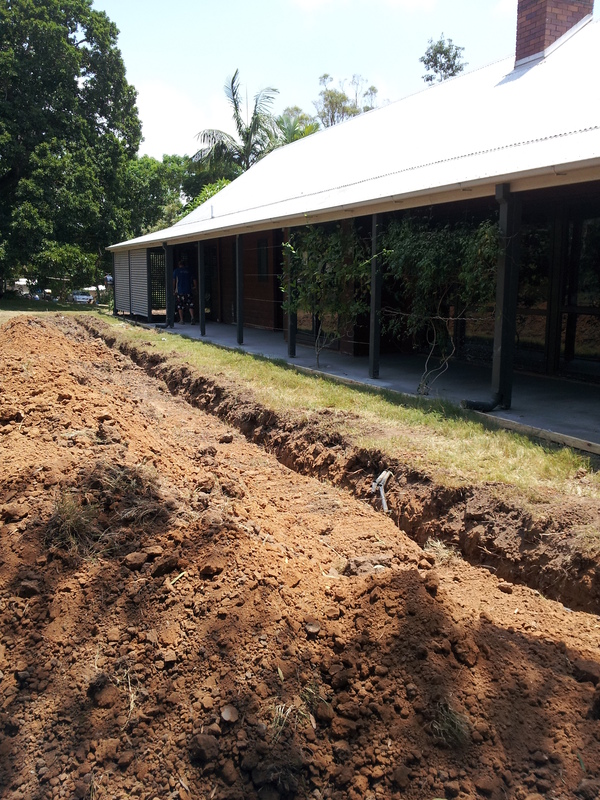 Front paddock gets new electrified fence. Janet works on website moggillhaven.com. 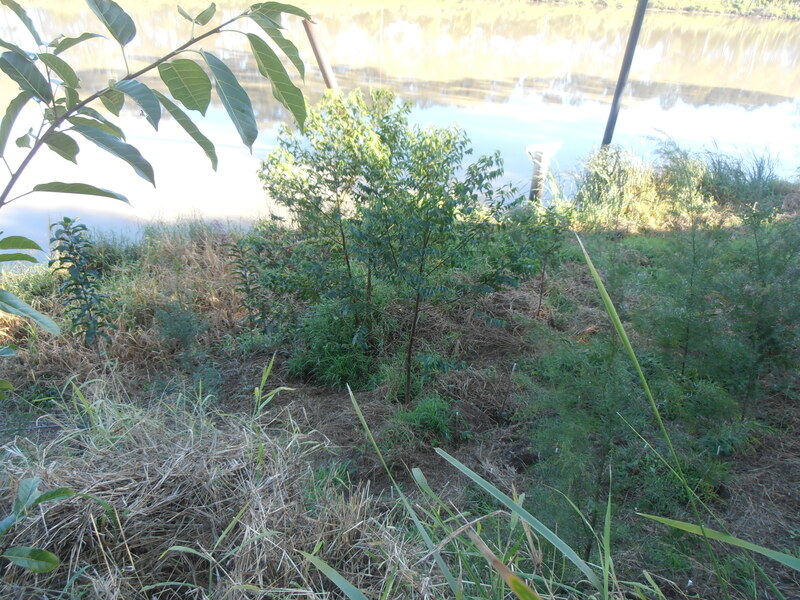 Giving attention to the side paddock and turning it into native habitat – northern slope area, regenerated plants under the Granddaddy Tereticornis, many more reeds and lomandras around the dam. Spring time is one long period of dry – using town water and dam water to keep newest plants alive. 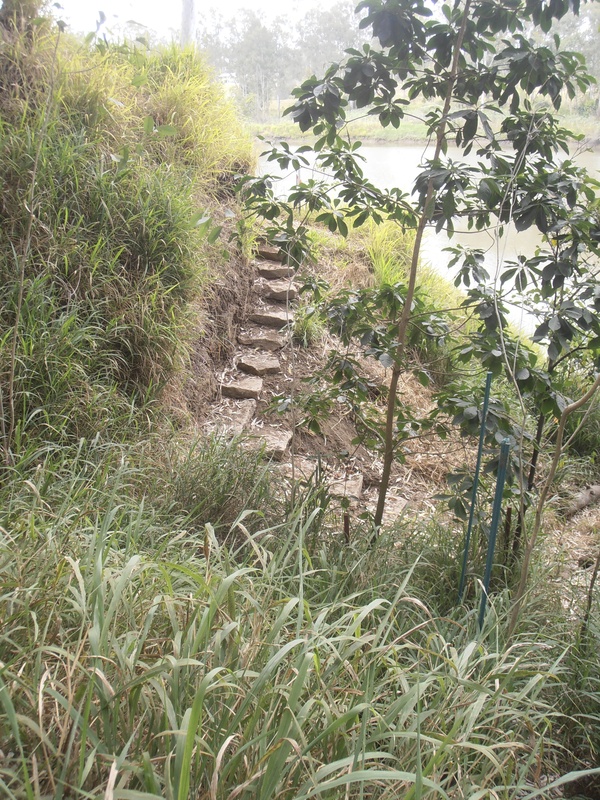 2013 is the Year of the Staircases that join up the different parts of the property’s riverbank. 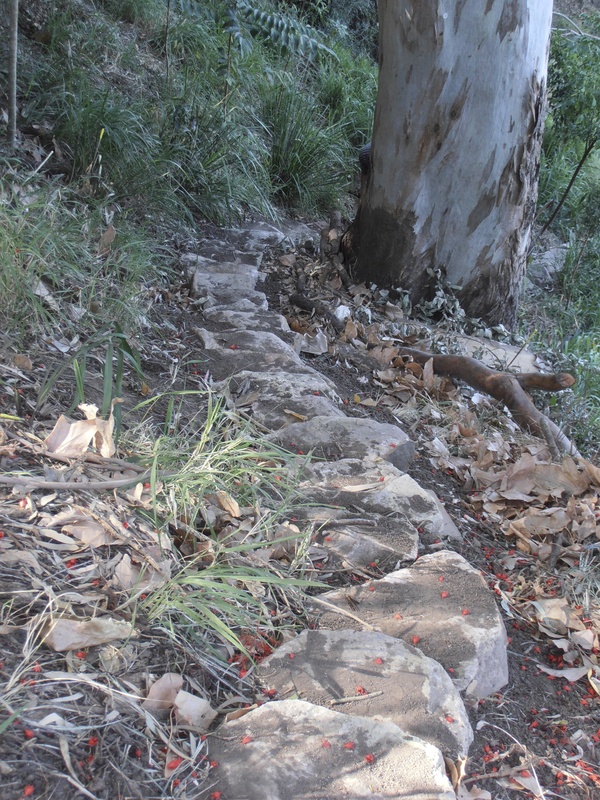 We now have one from grass-lawn bank to goat gully, from track down to pontoon area, from track up to cottage bank, from track down to mouth of main gully, from dam wall to main gully, from gully up to eroded bowl and overhang of riverbank, from northern slope down to groves. 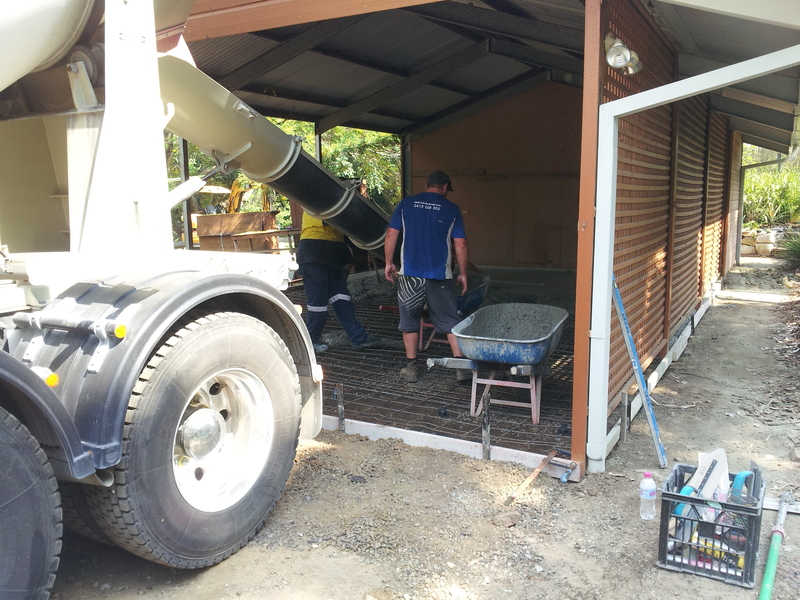 Ian arranges labouring assistance in revegetating the pontoon area for the 3rd time (previously in 2009, 2011). 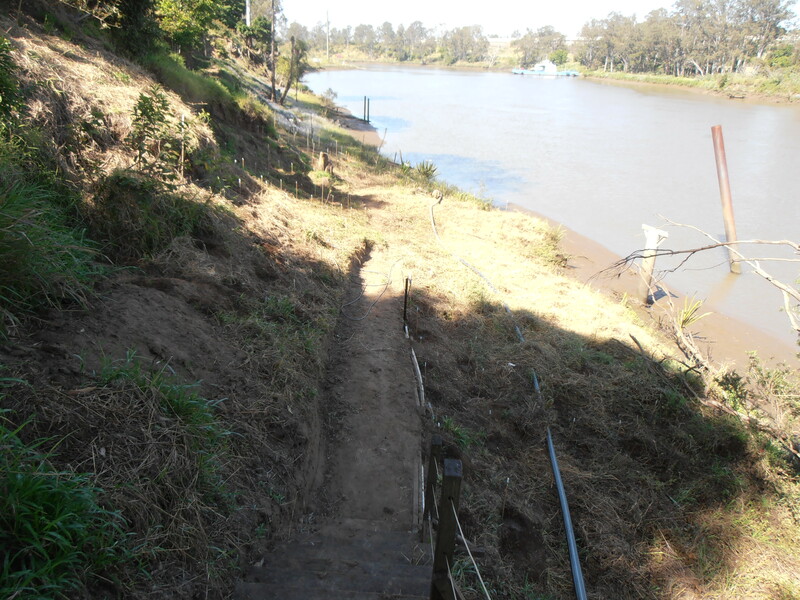 It is a daunting task as deep mud has settled over the steps and walkway. Ian constructs 2 taps to keep the new plants alive in the harsh western sun. All of the plants are natives from the Land For Wildlife program as well as the Moggill Creek Catchment Nursery – our painted stakes give an idea of the tens and tens of new plants. We are noticing more diversity of wildlife in 2013. A dry year which we designate the Year of the Grevillea. Accordingly we propagate our own grevilleas from cuttings and buy at least another dozen which we plant mostly in the front garden which is a difficult place for many other plants as it sits in the full sun a lot of the day. We add some new grevilleas to the jute mat area, the western side of the pool and the barbed wire grass area (side paddock). See more on our Post Everybody loves a grevillea. 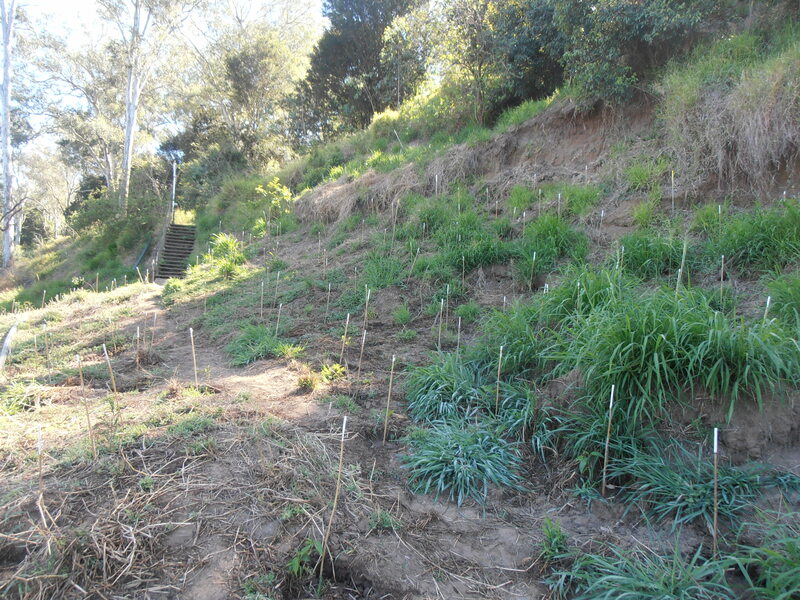 We concentrate on removing Rhodes Grass from house enclosure area and plant more native Barbed Wire Grass (from our own seedings) on the western side of the dam wall and in front of the cottage. The side paddock is gradually expanding into native habitat. 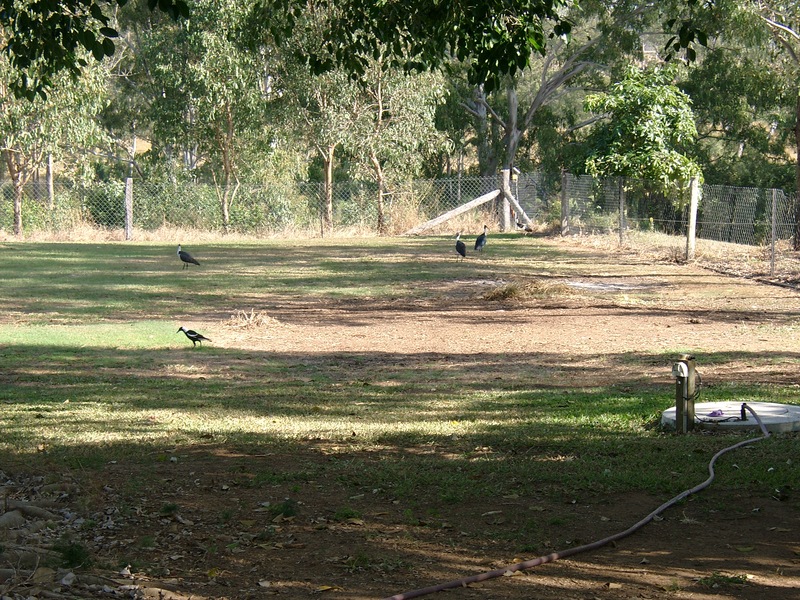 Our chooks free range in this paddock along with the guinea fowl and all kinds of pairs of native birds – native Wood Ducks, Pacific Black Ducks, Azure Kingfishers, Willy Wagtails, Purple Swamphens, Friarbirds. Two young Magpies visit us on our back patio, carolling away without any fear of humans. Ian forever planting! The goat gully yet again! 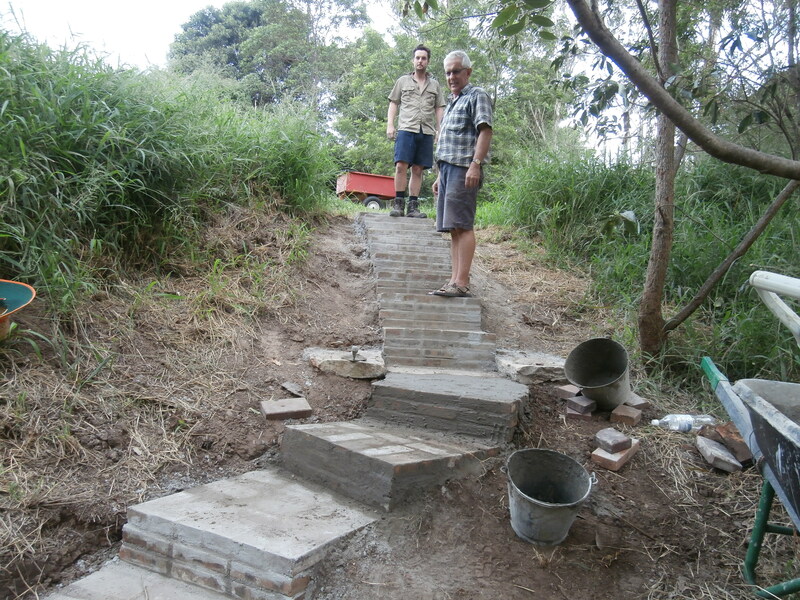 Ian works hard to encourage the new plants in the pontoon area as well as planting extensively yet again in the goat gully and on the pontoon bank. 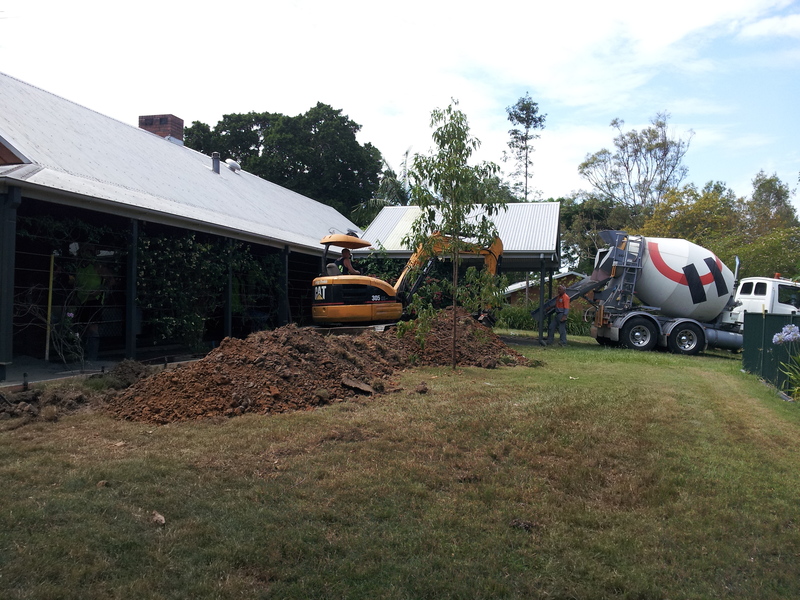 He plants 6 specimen trees in the front paddock – native Flame Trees, a Weeping Lilly Pilly, a Crows Ash and a Cheese Tree. These will compliment the young specimen fig trees already in the paddock. We plant up the vegetable garden differently so that we are not spraying the insects and grubs as much and we are concentrating on plants that we have previously grown successfully such as lettuce, spinach, leeks, potatoes, capsicums, chillis, eggplants, corn. By choosing plants with thicker skins we are harvesting more e.g. Grosse Lisse tomatoes, and we are picking some things earlier and smaller e.g. cucumbers. Ian is also using horse manure from the front paddock to build up the soil around the fruit trees – the ones that surround the vegetable enclosure- so that we will be able to eat more of our own lemons, figs, and oranges and maybe one day some bananas. 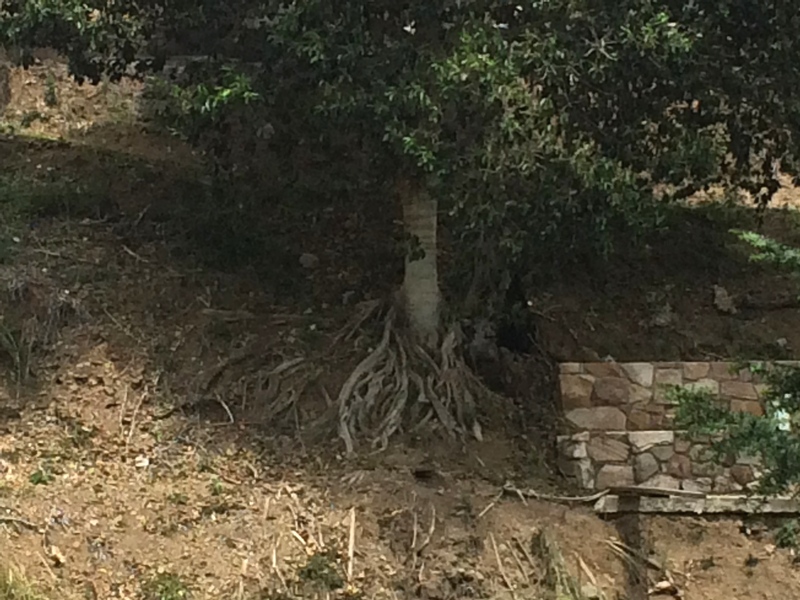 We come across a local fig tree that is holding the soil along a creek bank. 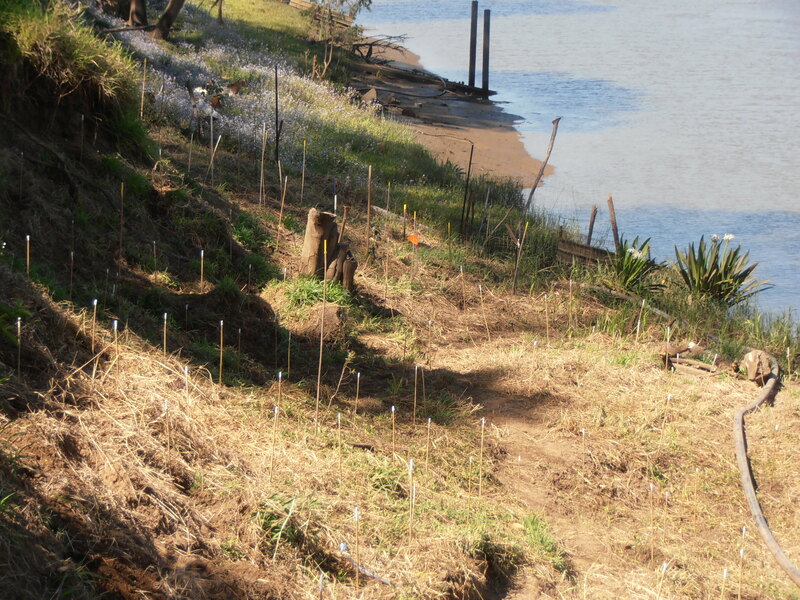 We are further inspired by the bulwark that figs provide to the bank further upriver from us, opposite Barellan Point, and so we plant yet more figs (White, Moreton Bay and Queensland Rubiginosa) in vulnerable places on our river bank to provide protection to the soil during floods.